The 49th celebrated its first anniversary in January of 1916 by redesigning its cap badge to incorporate windmills, a common feature in Flanders, and the regimental mascot, Lestock. (The latter had been promoted to wolf for heraldic purposes.) The 7th Brigade was now complete and moved into line on the southern shoulder of the Ypres Salient around Kemmel. After two relatively uneventful months, the brigade moved, in late March 1916, to the salient itself. The Ypres Salient came to be an enduring symbol of the vast waste of human life that occurred on the Western Front in the First World War. (Perhaps only the Somme is more readily associated with the carnage.) The 49th would take part in the battles - Sanctuary Wood, Mount Sorrel, and Passchendaele - that defined the struggle for this small and deadly patch of ground. Canadian Pioneers Clearing the Battlefield, Passchendaele, France, 1917. Part of the Ypres Salient, Passchendaele became synonymous with the futility of warfare on the Western Front. Countless lives were lost over territory that was fought over without the aid of any firm strategic or tactical planning. A salient is simply a bulge in the line that gives the defenders the advantage of being able to fire on those in the salient from three sides. 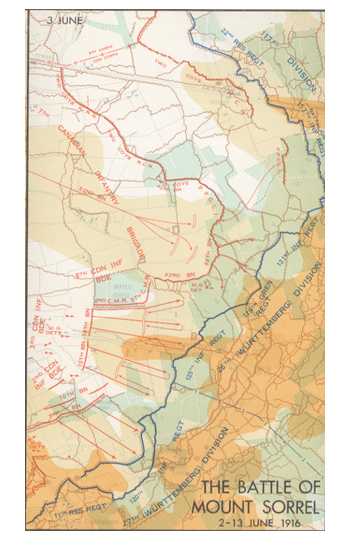 In the case of Ypres, the Germans had the additional advantage that most of their trenches were on the high ground overlooking the wet lowlands held by the British. Military historians agree that no discernible strategic or tactical reasons existed for holding the area. The rational course would have been to abandon the salient to the Germans and pull back a few kilometres to more defensible ground. Yet the British High Command could never bring itself to abandon the Ypres Salient. Its persistence was perhaps a function of the fact that the defence of Belgian neutrality had been a major reason for Britain entering the war, and Ypres was the last corner of Belgium not in German hands. By 1916, thousands of soldiers had already died defending the salient and tens of thousands more would pay the price by 1918. Many of these men would be from the 49th. Major-General M.S. Mercer, Commander 3rd Canadian Division, ca. 1916. General M.S. Mercer was killed during the German attack on Mount Sorrell in early June 1916. As a result, Colonel W.A. Griesbach was pressed into service to lead a counter-offensive against the Germans. Griesbach's force was composed of the 49th Battalion and two other battalions from the 9th Brigade. Through April and May, the regiment, along with the other battalions in the 7th Brigade, went through its regular rotation in a part of the salient south of the Ypres-Menin road. In this area, the British controlled a stretch of high ground known as Mount Sorrel. As one of the few dominating geographical features not in German hands, Mount Sorrel was a fairly obvious target for attack. The Germans were planning exactly that. On the final day of May, the 49th, having been relieved by the PPCLI, moved back through Ypres to rest. The battalion enjoyed slightly more than a day of rest before a massive bombardment and the explosion of several enormous mines marked the beginning of the attack. The men of the 49th were hastily recalled and marched in dispersed order through the heavy long-range shelling to Ypres and the front. The commander of the 3rd Division, General M.S. Mercer, was killed and several of his senior officers wounded in the initial bombardment. With a substantial portion of the Canadian officer corps dead or injured, Colonel Griesbach was given command of a hastily organized counterattack to be mounted by the 49th and two battalions from the 9th Brigade. G.W.L. Nicholson, Canadian Expeditionary Force, 1914-1919: Official History of the Canadian Army in the First World War (Ottawa: Queen's Printer, 1962). Courtesy of the Department of National Defence. The Forty-Niner, vol. 1, Number 11, 20 July 20, 1930. A Battle Report of Sanctuary Wood, June 1916. 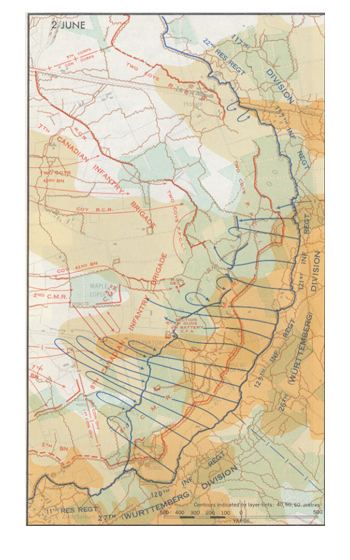 In this report, Lieutenant-Colonel William Griesbach, commanding officer of the 49th Battalion, narrates the events and provides analysis of the Battle of Sanctuary Wood, 3-6 June 1916. At this point in the war, both sides were beginning to realize that, while capturing an enemy trench line was relatively easy, holding it against counterattack was much more difficult. The Germans at Mount Sorrel had not only prepared the way for their attack by an unprecedented artillery bombardment, but also had made careful plans to use their guns to break up concentrations of troops moving up to counterattack. The only way for the Canadians to prevent this from happening would have been to undertake an equally heavy artillery preparation. Such a measure may have at least partially neutralized the German guns. At 8:45 p.m. on 2 June, the CO of the Canadian Corps, General Sir Julian Byng, ordered the 3rd Division to attack at 2:00 a.m. the following morning. The goal was to restore the line. No time was available to organize more than the skimpiest artillery shoot. The 49th began taking casualties as they moved into position through the massive traffic jams created in the rear areas by men, horses, guns and vehicles trying to occupy the same roads. The situation became worse closer to the front. Signaller F.R. Hasse recorded in his diary, "The great sandbag wall has been smashed up by German shells and the trench is one string of dead and wounded - you can tell which are the dead for they are quiet when we unavoidably tread on them in the darkness, but the wounded moan." (12) The wounded included the acting CO, Major C.Y. Weaver, and command passed to the adjutant, Major A.K. Hobbins. By 7:00 a.m., the other battalions had still not arrived, so the 49th was ordered to attack on its own. The Defence of Sanctuary Wood [June 1916], by Kenneth Keith Forbes. At Sanctuary Wood, soldiers of the Princess Patricia's Canadian Light Infantry (PPCLI) were trapped in an exposed salient, where they were being decimated by German fire. Of the units ordered to reinforce the PPCLI, only the 49th Battalion, under the command of Lieutenant-Colonel William Griesbach, arrived in time. The 49th successfully relieved the PPCLI, although its numbers were severely reduced during the effort. The regiment was to retake the area known as Sanctuary Wood on the northern slopes of Mount Sorrel (in spite of the name, the feature was just over 60-metres high). Here they were to link up with the remnants of the PPCLI, which had lost almost half its strength in the initial attack but was clinging grimly to a small section of the original line. The attack took place in daylight with little artillery support and was, predictably, a slaughter. (13) The 49th managed to reach the PPCLI and retake the original Canadian reserve trenches, but, by that time, it was down to less than half the numbers it had started with. When the 49th was relieved on 5 June, just 4 officers and 260 men were able to march out. In its first major battle, the 49th had performed admirably under impossible circumstances. On 13 June, the 1st Division under General Arthur Currie, after careful planning and a heavy artillery preparation, drove the Germans back and retook Mount Sorrel. The Canadians were learning, but, unfortunately for the 49th, its losses were part of the lesson. Gun Emplacements, Sanctuary Wood, France, June 1916. Canadian troops managed to retake gun emplacements, which the Germans had captured during an offensive in early June 1916. Little time was left to accomplish the integration. The British Army was preparing for its massive assault at the Somme and every available unit was needed in the line. Barely three weeks after Mount Sorrel, the 49th was back in Sanctuary Wood working hard to restore the obliterated trench lines. Heavy German artillery fire at dawn on 27 June caused 42 casualties, but the rest of the summer of 1916 was a quiet one for the Edmontonians and the rest of the 7th Brigade. 12. F.R. Hasse, "A Touched-Up War Diary," The Forty-Niner, no. 22 (January 1936): p. 5. 13. 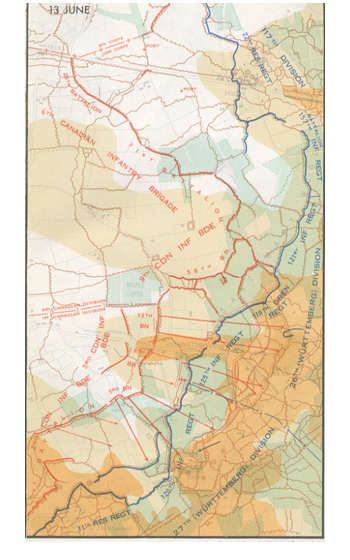 The clearest account and the best maps of the battle are in G.W.L. Nicholson, Canadian Expeditionary Force, 1914-1919 (Ottawa: Army Historical Section, 1962), pp. 147-154. 14. "By the Colonel," The Forty-Niner, no. 5: p. 4.